After two years of design and construction, Freightliner’s new GE Powerhaul locos hit the UK. Nos. 70001 & 70002 are the first examples of a brand new main line locomotive design to arrive in the UK for over a decade. AT AN EVENT at Newport Docks, Gwent, today (November 8th, 2009), representatives from Freightliner and General Electric unveiled the first two ‘Powerhaul’ locomotives to arrive in the UK. In this view, the two GEs await the ceremonial removal of the tarpaulins at Newport Dock, Gwent. The two Class 70s, Nos. 70001 & 70002, had set out from GE’s Erie works, Pennsylvania, on October 7th, loaded aboard flat wagons. They made the Atlantic crossing from Lamberts Point Docks in Norfolk, Virginia. Nos. 70002 & 70001 pose for the photographer at Newport Docks, Gwent. 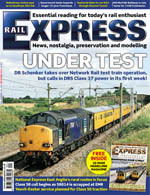 The full story of the event can be found in the next issue of RAIL EXPRESS magazine, on sale on November 27th. For now, here are a few pictures from the day’s ceremony. This entry was posted on Sunday, November 8th, 2009 at 8:47 pm and is filed under News. You can follow any responses to this entry through the RSS 2.0 feed. You can leave a response, or trackback from your own site. lovely! Hornby or bachmann 2009? or rex limited edition? The brutally straightlaced looking Class 70 has been quoted as 135 tons on paper and would have a high axleload being two tons heavier than HS4000 Kestrel. Lovely piece of kit, unusual looking but ground breaking machines. Hmmm…. these are ugly engines, but im slowly, growing to like them….. I think Bachmann would be good at this one….. But what I would like to see, is REM LTD edition of a Bachmann 66 in Colas Livery…. hmmmm, yes, very ugly. Not unlike a class 58 central portion with the ends put together by aesthetically-challenged designers with a weird sense of humour. However, it is new, exciting, it will grow on people and it will make a fine model. I agree with Jack, a Colas 66 is going to be the best 66 livery yet. Rail Express, have you phoned Bachmann yet? nice to see a new shape on the rails.I hope it performs ok and we get more on the network, it looks but nice well done railfreight. what paintthiner was the designer sniffin when he though of this design but i wouldnt mind 1 in front of a rake of 10-12 heavy haul coal hoppers? Another new character for the “Underground Ernie” series if a pair of eyes painted on!!! Have been watching 70 001 scuttling around Washford heath this week, juries still out on design but it does produce lots of light blue exhaust. This afternoon it passed 56 312 sharing siding space with 60 045 and I was to slow with my camera! Have also seen 56 114 have an engine lift [it was working when it arrived] and 56 311 has had pistons removed. Ugly Betty rules – OK !!! Bachmann are bringing this one out with the Freightliner livery in which they have said that they will be on the Freightliner website to buy – Source Bachmann website. Personally im not too keen on them i seem to see them as something you would see in italy or germany. perfure the class 66’s. but maybe they will grow on me but who knows.